So perhaps if we draw from the Victorian Flower Oracle, it will help usher in spring? Not sure about the rest of you, but our current season is being shy, it seems. Anyway, today’s card had a strong partner in Narcissus – Vanity, so perhaps be on the look out for that as well. Blessings! 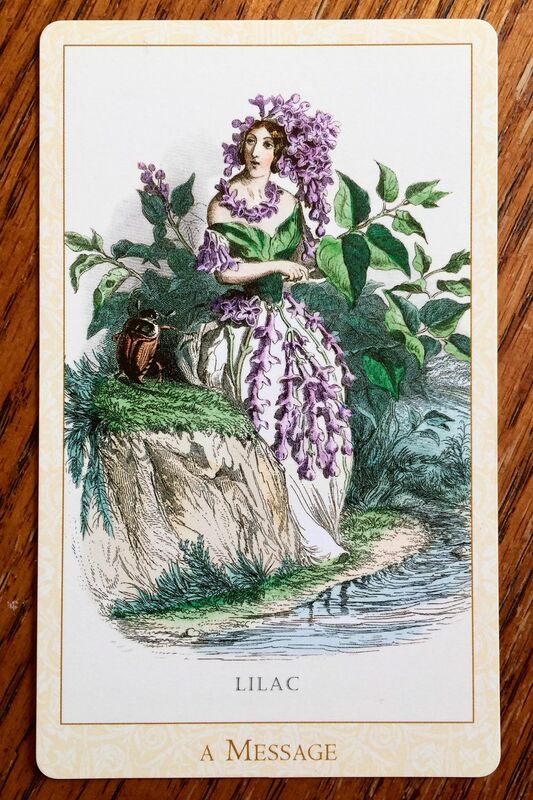 Meaning: Artist JJ Grandview depicts Lilac as an attractive young woman who must be feeling very fragrant indeed. Not only is her dress festooned with lilac flowers, her necklace is made of them as well, and she also has a generous array of blooms in her hair. She is outdoors in springtime, and on a small grassy bank a brown beetle is standing upright and delivering a message. Apart from Lilac’s expression of slight surprise, there are no clues to the nature of this message. At least, there is no shock on her face, so let’s presume the message is not bad news. She looks interested, not upset. Perhaps the beetle has brought her surprising or gratifying news of a friend or an invitation of some kind. Sadly, you are unlikely to receive a message from a beetle – it is more likely to come via email or text – but if you draw this card perhaps a similarly pleasant message is in store for you soon. Or perhaps you need to think about contacting someone. I snow a good moment for you to send that message, good or bad, that you have been meaning to get round to? A word of warning, though. Some messages are misleading. They can stem from a genuine misunderstanding but sometimes they come from someone intent on causing trouble. If you know someone in the habit of spreading disinformation – deliberately and with calculation – this might be a good time to steer clear of them. I am enjoying reading the daily cards. You always have a “spot on” message. And how appropriate to have a lilac card, although, our lilacs will not bloom til the end of May. Their sweet fragrance is always something special. Thank you so much! I enjoy pulling the cards, and find it interesting what deck I’m drawn to and which card makes an appearance. Our lilacs are a ways off as well, but it’s a cheery thought!